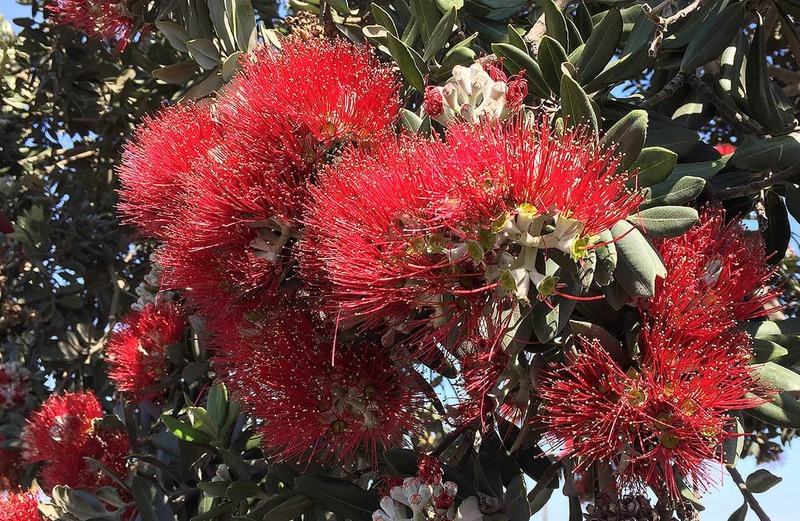 A native of the North Island of New Zealand, the New Zealand Christmas Tree blooms during December (when it is summertime “down under”) and is in full bloom at Christmas (hence the name). Its deep red flowers are spectacular when they turn the canopy crimson against glossy green leaves from May through July. This tree is perfectly suited for Santa Barbara, especially near the coast, because it thrives even in the salty mist and wind from the ocean. It has the unusual trait of developing aerial roots on its lower branches – these roots can absorb moisture right out of the fog. In fact, it can practically grow on the beach! For our area, its best characteristics are slow growth, simple maintenance, and low water needs. Its slow growth of 6-12 inches or less per year makes it easy to maintain as a small tree, although it can reach a height and spread of 30 feet or more if left untended. Unpruned, it will develop attractive, gracefully sculpted, multiple-trunks, but can be trained back to a single trunk for confined spaces. It does better with some irrigation in the dry season, but can survive on our average rainfall once established. It can tolerate a wide variety of soil conditions, but performs best near the coast and in warmer areas, since it can suffer frost damage. Its botanical name is Metrosideros excelsa. The genus name, Metrosideros, is from the Greek words metra or “heartwood” and sideron or “iron”, referring to its dense hard wood. The species name, excelsa, is from the Latin “excelsus”, meaning tallest or supreme. 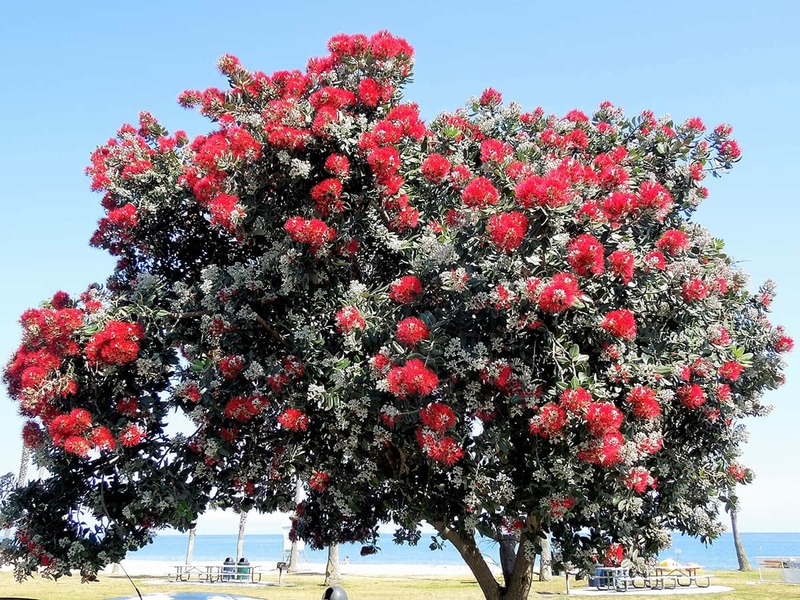 The Maori, the indigenous people of New Zealand, gave it the name “Pohutukawa”. New Zealand Christmas trees have been planted in Santa Barbara since the late 1800’s. They are seen as either street trees or as landscape garden trees in the areas of East Beach, West Beach, and the Mesa. Street trees are found on the first blocks of East and West Figueroa Street, on the 100, 200, and 300 blocks of Bath Street, on Milpas Street (interplanted with Ficus), Santa Rita Circle (on the Mesa), and at the Harbor. Tree-of-the-Month articles are sponsored by Santa Barbara Beautiful, whose missions include the increase of public awareness and appreciation of Santa Barbara’s many outstanding trees and, in a long-time partnership with the City Parks & Recreation Department, the funding and planting of trees along the City’s streets – a project which has resulted in the planting, to date, of more than 12,000 street trees.